Over the past two years, the stretch of H Street between 10th and 14th Streets, NE, has seen quite a bit of activity. The Atlas District, as it is known, is becoming a destination for theater, live music, and one of the more eclectic bar scenes in Washington. With the opening of Dr. Granville Moore's at 1238 H Street, NE, last year, the Atlas District gained its first honest-to-goodness dining destination. Since its opening, Granville Moore's has been joined by Napa 1015, an upscale dining establishment that shares GM's commitment to fresh, local ingredients, and a reinvented Argonaut, a neighborhood pub that shares GM's culinary inspirations thanks to a chef who came recommended by GM's executive chef, Teddy Folkman. But Granville Moore's remains the highlight of the Atlas District, and the crowds are a testament to their continued popularity. Granville Moore's is, first and foremost, a tribute to some of the best things that Belgium has contributed to international cuisine - mussels (moules), beers of every conceivable body and style, and golden fried potatoes (frites). Though it is certainly not the first place in the District to mine this particular territory - Belga Cafe on Barracks Row offers a similarly inspired menu of mussels as well as a wide range of Belgian-influenced dishes and Chef Robert Wiedmaier's Brasserie Beck boasts a beer list of equally impressive pedigree - Granville Moore's offers their food and beverages in a laid-back pub atmosphere that demystifies the various dubbels, tripels and lambics that populate the menu. 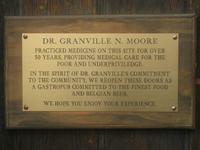 Granville Moore's is named after the neighborhood doctor whose practice was based in the building that the pub now occupies. He is commemorated by a plaque on the door and his old practice sign that still sits in the second-story window, but these memorials are easily overlooked at night. Upon entering the narrow townhouse, visitors are likely to be struck by the (intentionally) unfinished look - exposed brick and beams, lots of dark wood and a slightly dusty haze - and by the din of multiple conversations competing with each other along the length of the space. With almost half of the ground floor occupied by the rustic-looking bar, there are only six booths and tables available for seating at any given time. Another half a dozen booths and tables can be found upstairs (along with a second bar and the kitchen), and there is an outdoor beer garden with more seating that will see quite a bit of use as the weather continues to warm up. The staff does their best to accommodate everyone, maintaining a waiting list where guests can provide their cell phones to receive a call when a table is available - allowing them to visit another nearby bar like the Pug or the H Street Martini Lounge until they can be seated. They also accept reservations for parties of six or more Monday through Thursday nights. Over several visits, my wife and I were fortunate enough to be seated on several occasions, though we did enjoy a meal at the upstairs bar and found the service no less attentive there. The bartenders and the servers alike are well-versed in the virtues of the beers they serve, and they seem happy to provide recommendations based on what a guest has previously tried and liked (or disliked). 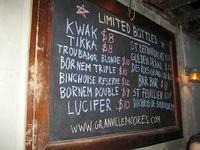 With a beer menu that runs to the dozens, that's no small feat - and their help can be crucial if you arrive late on a weekend night and find your favorites erased from the chalkboard where the beers are listed (indicating that they are sold out). Sometimes service can be spread a bit thin on busy nights, resulting in inconsistencies and oversights - a dining companion had to repeat her request for water several times despite the rest of us receiving our beers quickly; sauces for frites are occasionally delivered long before the frites themselves, as they are stored behind the bar and not in the kitchen; overlooked silverware had to be requested. And although most of what comes from the kitchen is delicious, there are some missteps there, as well, such as a bison burger that came with unevenly warmed cheese, resulting in a cool, chewy mass of cheddar atop the center of the patty. On the whole, however, there are few causes for complaint. We tried several of the mussel preparations over our visits, and there are definitely standouts among them. Despite their higher cost, Granville Moore's features rope-grown mussels from Prince Edward Island. This sustainable cultivation practice results in bigger, meatier mussels with less grit while allowing for faster maturation. 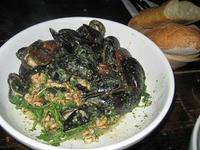 The classic Moules Mariniere give off a fragrant steam of white wine and herbs. Though not the best version of this dish I've ever tasted, it was definitely well executed. More enjoyable is the Moules Au Pesto, which features a rich walnut-arugula pesto that is offset by an acidic note of lemon. A third mussel dish that features blue cheese, bacon and spinach was a bit too thin for my taste - I would have preferred more of a noticeably smoky, salty flavor. All of the mussel dishes sell for $14, but the portions are large enough to serve as an entire meal on their own so they don't feel overpriced. A recent innovation, Moules Mondays, knocks the price down to $10 on Monday evenings as a further incentive to give them a try. The menu offers a range of appetizers, including a bison chili, several salads, and the requisite charcuterie platter, but none of them really stood out enough to warrant our attention on our previous visits. Sandwiches and entrees, however, are another story. The menu features several presentations of bison meat sourced from New Frontiers Bison in Madison, Virginia. Their brisket sandwich, served with cheddar cheese, sauteed onions and horseradish cream, was tender and tangy, a great combination of heat and meat that required the use of a fork and knife to truly appreciate. Although a gastropub may not be the first place one would think to try fish specials, several of the options have been tempting enough to make us rethink our commitment to mussels and frites. 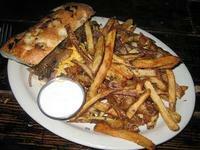 And those frites are truly outstanding. Hand-cut and twice fried, they are light and crisp with just the right amount of peanut oil lingering on them as they make their way from the kitchen to the table. They are topped with sea salt and fresh herbs, giving them an aroma and a flavor that is enjoyable on their own. The six house-made dipping sauces you can choose to accompany them seem almost superfluous - until they are tasted. A Dijon-flavored mayonnaise is rich without being heavy, and the horseradish cream that topped the bison sandwich is equally appropriate as a dip for the frites. Garlic ranch is not to be missed. Unfortunately, each small order of fries ($4) only comes with one sauce - further incentive to spring for the large ($7) which comes with two - additional sauces can be had for $1 each. If you're planning to order a sandwich or an entree, it should be noted that they all come with a side of frites (and one sauce). All of this is accomplished in a kitchen the size of most people's bathrooms. Despite the lack of a stove and the cramped quarters, two or three chefs (including Folkman) work the line on any given night. Over the course of a week, these guys turn out more than 500 pounds of mussels and closer to 1000 pounds of frites. Add in the numerous burgers, sandwiches and entrees that an average dinner service commands and you get a pretty good idea of just how hard (and how effectively) this kitchen staff is working. Chef Folkman has recently been hinting at a forthcoming spring menu that will continue to focus on local produce (from an Amish farming community in Pennsylvania) and that delicious Virginia bison in even more creative presentations - a bison tartare studded with capers and black truffles and dressed with first-pressed Spanish olive oil was delicious and unctuous despite the lack of egg ("I don't always trust raw eggs," said Folkman, "but I know I can trust my bison!"). Beers run the gamut from the well known Stella Artois ($4 on tap) and Chimay ($7.50 for red, $9 each for white and blue) to labels that are likely to surprise even the most knowledgeable beer drinker. And, as is de rigeur for discerning Belgian beer purveyors, they pride themselves on serving every beer in the appropriate glass - many of them branded with the logo of the beer they are meant to be paired with. Four beers are offered on tap downstairs, where they tend to come and go pretty quickly. Make sure you check the board to see what's on hand when you visit, and don't hesitate to ask questions. It came as no surprise to learn that the Food Network is highlighting Granville Moore's wonderful moules and frites in a segment of their upcoming series "America Eats." Camera crews filmed the early part of the dinner service on Monday, March 17th. The YouTube clip of Teddy Folkman I linked to in the first paragraph was actually his audition tape! UPDATE: As suspected, the "America Eats" story was a cover for a "Throwdown with Bobby Flay." On Tuesday, Teddy and his crew set up at the Argonaut (another local establishment in the 1400 block of H Street) to put on a mussel-cooking demonstration, only to be surprised by Bobby Flay showing up and issuing a "moules and frites" challenge. Watch for it sometime in late May or early June on the Food Network! If you've been meaning to check out the emerging bar scene on H Street, NE, you owe it to yourself to make Granville Moore's part of the trip. It's worth the wait. Parking: Street parking is available throughout the nearby neighborhood, but it can be difficult to find on busy weekend nights. Closest Metro: Union Station, but be advised that it's a 12-block walk from Union Station. You would be better off grabbing a cab or riding the X1 or X2 bus, both of which follow H Street. Reservations: Only taken for parties of six or more, and only a few per night. Staff maintains a waiting list for tables on busy nights and will take your cell phone number to call you when your table is ready. Baby-Child friendly Rating: 1 diaper (to borrow Jason's system). The loud and boisterous atmosphere coupled with the two small restrooms make this a less-than-ideal choice for families with small children, but they are certainly not discouraged. Bathroom Rating: Two small bathrooms on the ground floor. Clean, but with few amenities to speak of. Great review! I'll be mentioning the Throwdown with Bobby Flay in my Weekly Blog Round Up this wee. Endless Simmer did some nice coverage on it with photos. Oh man, in that picture of me and Amy I look like I'm really pissed about something. We finally ate there a couple weeks ago. The food was good. We ordered mussels, frites, and steak. Pros: Great atmosphere, hip and fun. Great beer selection, including those on tap. Good food. Cons: TERRIBLE service. REALLY REALLY bad service. Our waitress whispered. In a noisy room, she refused to talk above a whisper. So we could not hear any of the beer or food specials. We asked several times, and she still only whispered. They forgot several of our items, forgot to bring silverware and dipping sauces for the fries. Beware of the great fries: a "small" order can easily be split by 2-3 people. A large order serves 4-6 people. And the portion served with the entrees is HUGE. 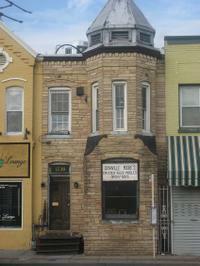 I am still in disbelief of the horrible service that I was given on Tuesday February 10th 2009 at Granville Moore's. I and three of my co workers came in for food and drinks and wanted to sit at a table after a long day, we asked to sit at a table and were told that the table in the back was for parties that were ordering dinner. Next since we all decided to order food and there were no other people waiting we nicely asked if we could sit back at the table and the bartender RUDLEY said no and that we had to be ordering full dinners and only three of us were. A few minutes went by and a four top table opened up so again we nicely asked if we could sit at that table and the bartender yelled "FINE, DO WHATEVER YOU WANT! I ALREADY TOLD YOU GUYS LIKE NINE TIMES THAT YOU COULD NOT SIT AT A TABLE!" Clearly my co workers and I were not going to be treated poorly so we left before we could even try the food and barely had a sip of our drinks. Then another employee came outside and asked for us to pay our tab and we told him nicely that we do not pay for bad service and to take it out of the bartenders check. He rudely said that we were not welcome there.......funny we already left. I just want to know why is the staff at Granville Moore's so angry? Hm. While I've not been to Granville Moore's (yet) and certainly wasn't there on Feb. 10, I just gotta say -- Ginae sounds like an awful person. I visited on June 9, had great mussels (Moules Fromage Bleu), the Frites were alright (the sauces are what make them) and enjoyed the wide beer selection. The service was mixed: the bartender was very friendly and helpful but the hostess was cold and rude (even though the place was not packed and there was no need to be so brusque). Luckily the rest of the experience made up for that poor start. I visited in December 2008 and I loved this place. I was on a visit to DC from London and my friends who live locally took me there. The food was superb and the service was great. Admittedly it took us quite a while to get a table, but given this place is so popular and you cant book then i am not surprised. We happily sat at the bar with drinks (terrific belgium beers!) and waited and the service at the bar was just as good. I am coming back to DC for the 4th July weekend and have asked my mates if we can go again - we are and i cant wait! !